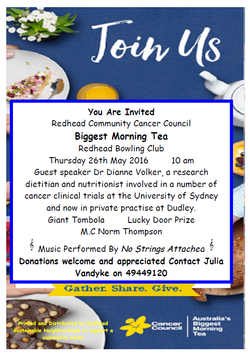 For the last few years the Redhead Sustainable Neighbourhood has supported their local Redhead Community Cancer Council by helping promote their Biggest Morning Tea event. The group assists by designing the promotional flier, and organising and donating the cost of printing. The Redhead Sustainable Neighbourhood newsletter team then letterbox the fliers to all households in Redhead, and distributes the flier via their eNewsletter, website and Facebook page. 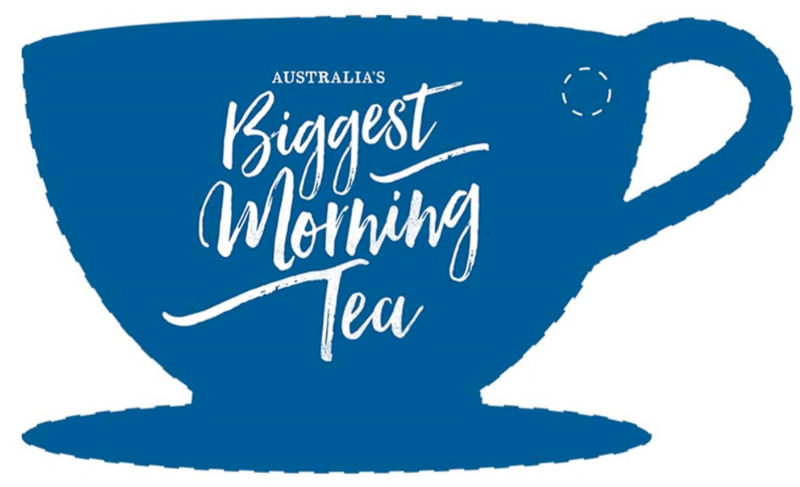 With the Sustainable Neighbourhood group's assistance, attendance at the annual morning tea has grown significantly, along with the amount of funds raised for the Cancer Council. This initiative is an excellent example of how Sustainable Neighbourhood groups can link with other local community groups, and help support each other. Guest speaker Dr Dianne Volker, a research dietitian and nutritionist involved in a number of cancer clinical trials at the University of Sydney, and now in private practice in Dudley. Donations welcome and appreciated. Contact Julia Vandyke on 4944 9120.